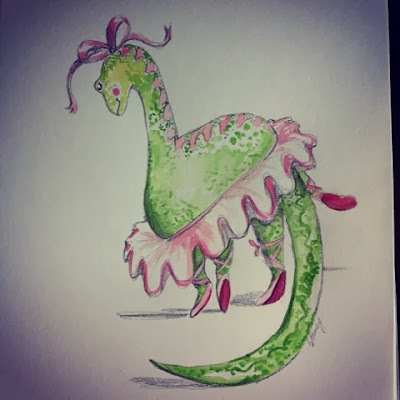 I'm drawing again today, ain't nothing going to get in my way .......apart from a shy looking dancing dinosaur, apart from that, I'll draw some thing edgy and sensible. It's not her fault, the dinosaur, Bronte, she would be horrified to think she had got in the way but I can't help thinking about her. She's shy, painfully so, and really wants to tell people that dinosaurs aren't all big and scary but can be lithe and even dainty. Her dance of choice is ballet but she can also perform a mean street routine to Riverdance and her Hokey Cokey is amazing, course it's all to the mirror in her bedroom but one day she hopes to shock the relatives at Christmas with a quick Cha Cha Cha before the queens speech. But I won't be distracted, no, no ,not me!